Amber BroochesThere are 25 products. 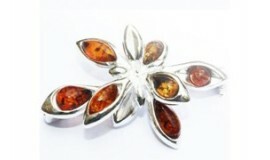 If you are the type of person that likes variety then you will love what you can find in our amber brooches collection . There is such diversity in colors and styles that you could easily have a different look every day of the year without wearing the same amber brooches again. Natural, handmade Baltic amber brooches in a different shape and color will guarantee your own, unique style. Amber brooch with stems of silver have scatterings of amber in various colors. Modern and very elegant curve of silver gives this amber brooch a modern feel. Handcrafted Amber brooch is made from old silver tone metal, decorated by shining amber stones.